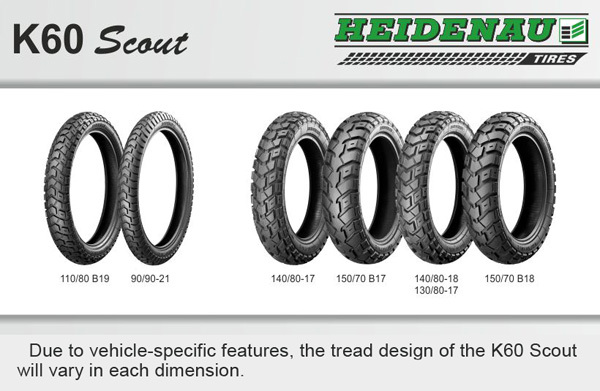 DESCRIPTION Ordinary looking but hard wearing dual sport tyres although there is some confusion over differing tread patterns on Heidenau tyres branded as ‘K60 Scouts’. 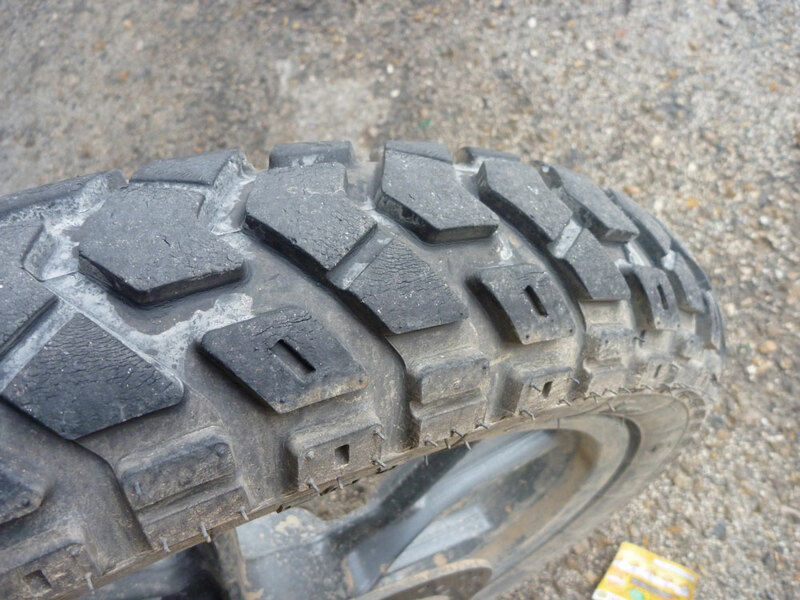 The fourth tyre below might look to have less mud traction than the tyres to either side due to the solid central strip. As I understand it, it’s to do with the likely power and weight of the bigger bikes that a rear 17-inch K60 might get fitted to. I’m guessing the 150/70 B17 (tyre #4) suits powerful 1200+ adv bikes which would wear down and squirm the other K60s more readily. 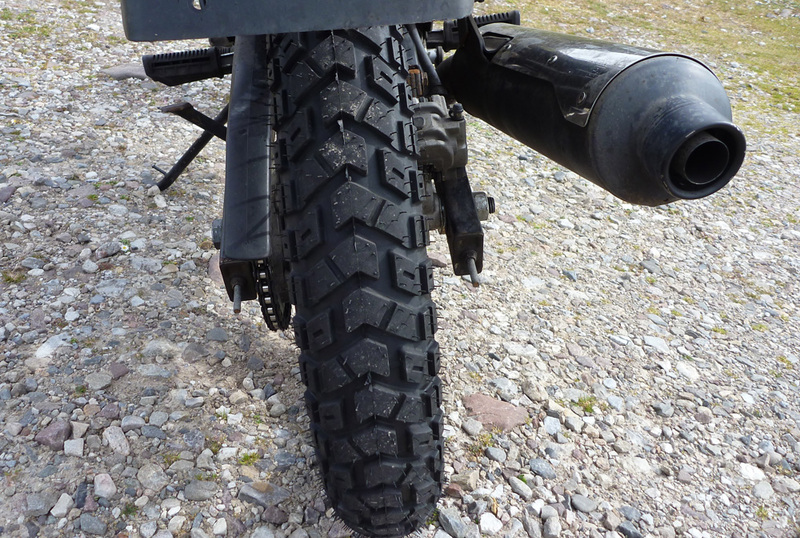 The tyres I used in Morocco on the BMW F650GS twin were #1 and #3 in the line up below. On the GS500R I fitted #1 front and rear. In 2015 I fitted a K60 (#1) to the front of my CB500X RR run tubeless. Again, no complaints. 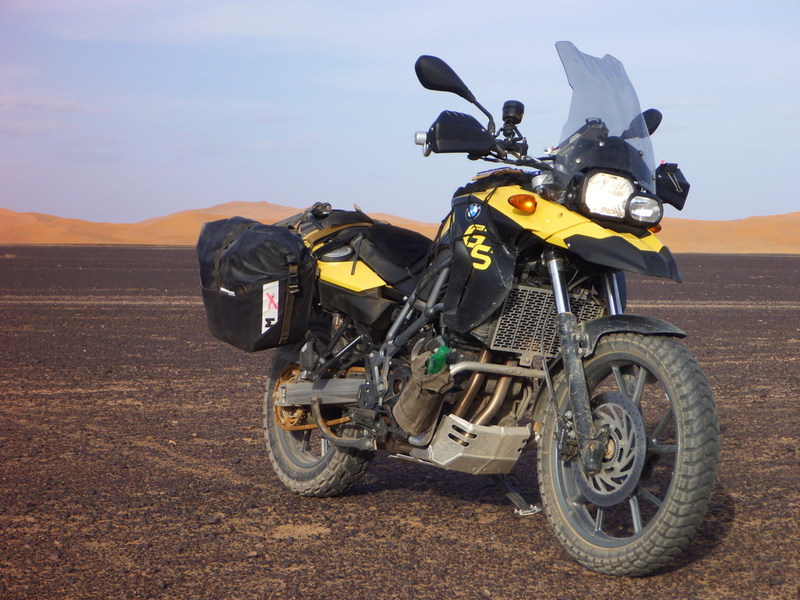 WHERE TESTED In Spain and Morocco; about 3800 miles including a few hundred off-road riding on a BMW F650GS SE. Also fitted 110/80 B-19 Tyre K60 (Enduro) Scout to both wheels of my own Suzuki GS500R. Then another 3000 miles with the front on the CB500X. IN A LINE A dual sport tyre that works very well in dry dirt and on roads as wet as you like, but manages to last for thousands of miles. PRO Works great from soft sand to wet roads. Wears very slowly. CON The rear on the BMW took a good few hundred miles to bed in (on the Suzuki new rear felt fine). The sizes I needed for the BMW were expensive in the UK (but since found a much cheaper source from Germany, see below). 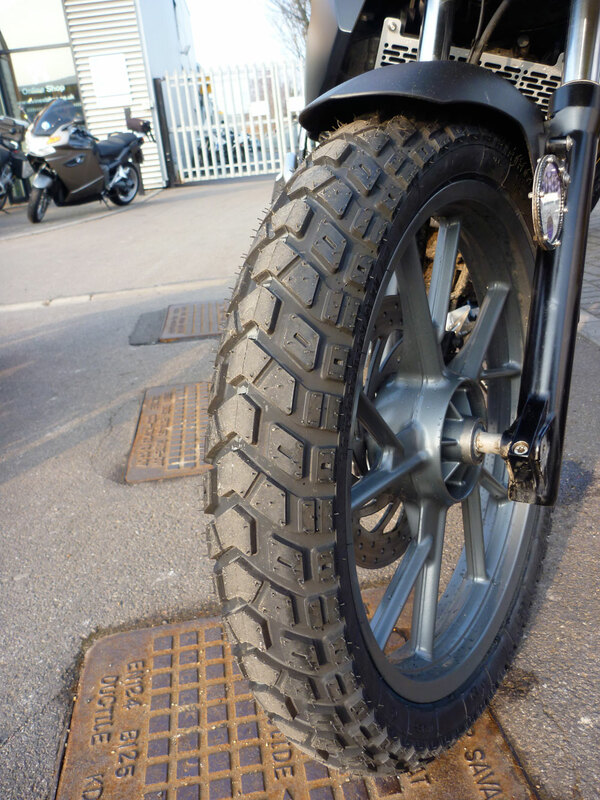 REVIEW On the BMW these tyres took a long time to bed in and feel predictable and secure. It’s something I put down what must be a hard compound that takes a while to adopt the bike’s profile. Since then they’ve just got better and better, be it on desert tracks, Moroccan back roads, storm-lashed motorways and even slick steel ferry ramps. They’re simply the best dual sport tyre I’ve used for years and might last a trans-continental trip. If you ride a big bike fast at home and rarely leave the road, you might prefer conventional Anakees and Tourances. Right from pulling away new they felt edgy and followed long lines and tarmac joins, or at times felt outright double punctured. At 30/35 psi they felt over inflated and on marbles; that feeling took several hundred miles to go away. Thereafter on the road they matched my moderate riding style and the bike’s ability very well while, like any self-respecting knobbly, still whining reassuringly on smooth roads. Even in the wet they never gave any heart stopping slips. I have to say they worked as well here as any Tourance-type road tyre I’ve used. On dry desert dirt was biggest surprise. Whether it’s the the digger-like chevron pattern, they were much better than expected, even with little meddling with pressures. On gnarly stony pistes and gravel dirt roads they tracked well and reacted predictably, bearing in mind the speeds you want to ride a 220-kilo GS alone in the desert. Even in deep sand, the bane of heavy trail bikes, something enabled the bike to track unnervingly straight, feet up at 5-10 mph, until I’d lose my nerve and say ‘this can’t be happening’, deploy my outriggers and start paddling. You’ll notice the rear in the newer ‘Catspaw’ Scout for larger bikes with a sunken (when new) central ridge supporting the blocks, and the front is the original, more blocky K60 style ‘Enduro’ pattern which you can still get on the back in smaller sizes. They both worked well as a pair, even if they are clearly less aggressive than a Conti TKC, especially on the edges. But if you accelerate and brake smoothly from dirt bend to bend, they felt as good, even though they oughtn’t. And it looks like they’ll last at least twice as long. On the BMW the back wasn’t even a third worn after 3800 miles, so I’d guess 10,000 miles from the back and half as much again on the front. 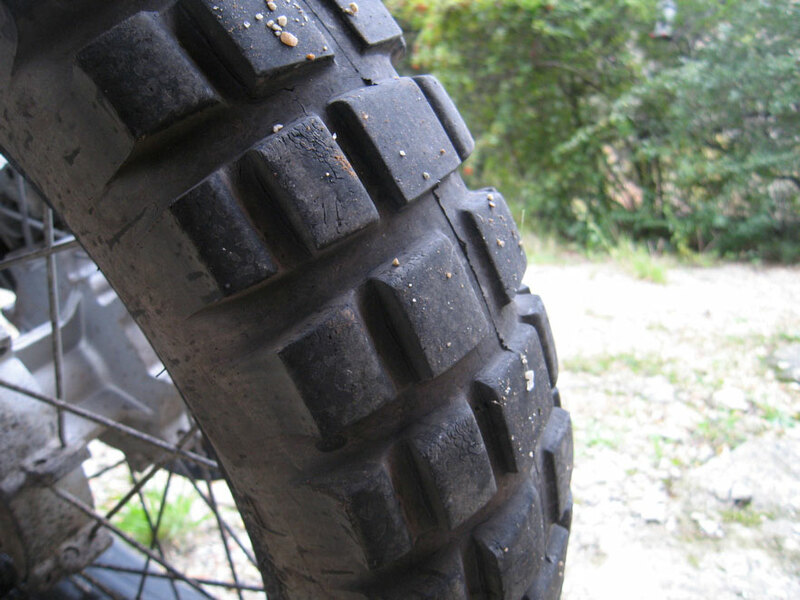 That alone makes them a great adventure biking tyre. Once set could see you across Africa, even on a heavy GS. No rock gouges, other damage or punctures. You do wonder if they’re so hard they’ll start cracking long before the tread wears out. Time will tell. I gave the bike back but kept the tyres for my own project bike. I fitted the part worn front to the front of my GS and the same tyre new on the back. Pressures (with 20kg baggage, max speeds 75mph) Dropped from 35/30 when new to 32/25 in deep sand, and much later 25/21 when unloaded until ride back to Spain back up to 32/28 and then 34/30 for fast and wet Spain transit. 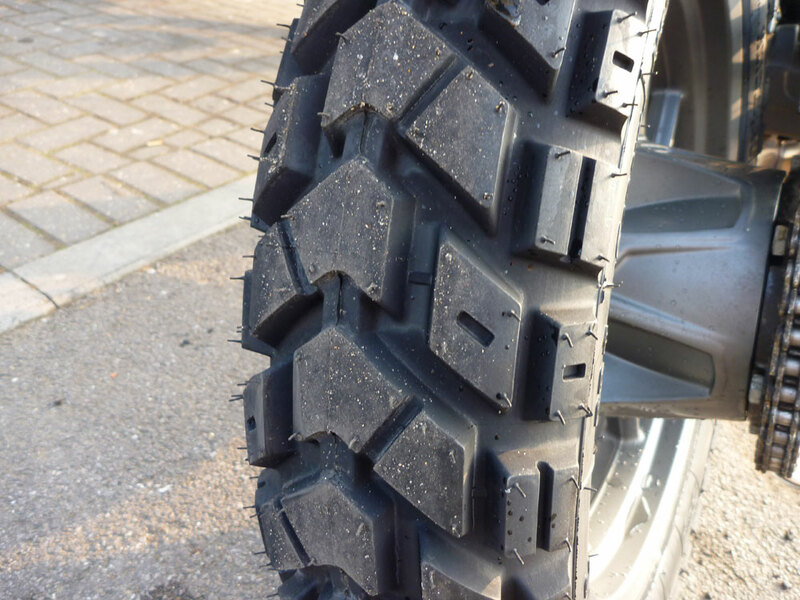 Update July 2012: I’ve fitted a pair of 110/80 130/80-17 69 T £ 62 19″ Scouts to my GS-R with Tubliss liners and must say there’s no ‘edginess’ on either tyre, as I experienced on the BMW in the first few hundred miles. And so I do wonder if it was the rear ‘Catspaw’ pattern with the solid centre block which made the bike feel insecure for a while. I’ve been waiting for that same feeling on the Suzuki, but they feel as normal as the preceding road tyres. Coming back 700 miles from Scotland, the tyres didn’t budge in hours of streaming rain on the motorway or across London. 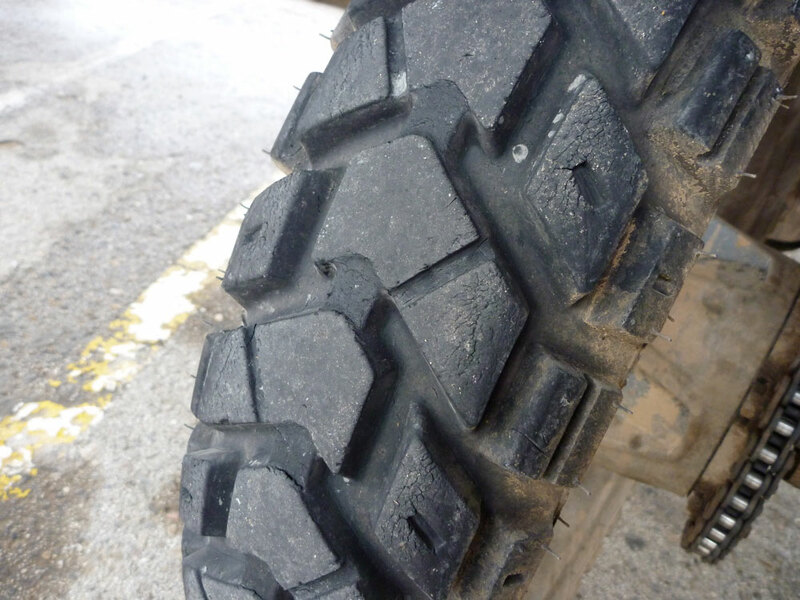 For a hard-compound tyre with a blocky tread, that’s pretty unusual. Update September 2014: Loosing pressure inexplicably? See this video. Update September 2018: Chose K60 for my XScrambleR 700 project bike (right) for Morocco. No regrets – still a brilliant and long lasting do-it-all tyre. Pictures below, new and after 3800 miles on the BMW. Compare with the TKC after similar mileage on a Tenere. Heidenau 140/80 T-17 Tyre K60 (Catspaw) after 3800 miles. 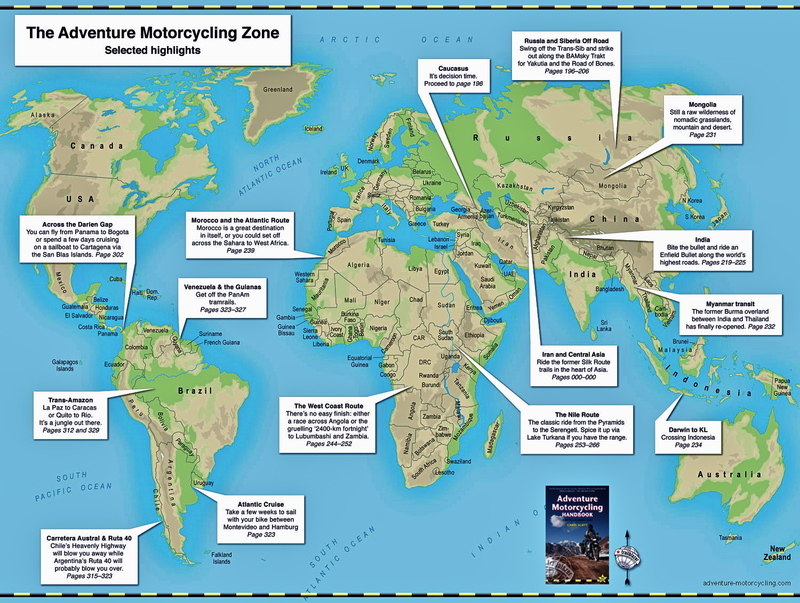 This entry was posted in Adventure Motorcycling Gear Reviews, AMH News, BMW F650GS SE long term test, Suzuki GS500R Overlander and tagged adventure motorcycling handbook gear reviews, BMW F650GS SE, Heidenau 110/80 B-19 Tyre K60, Heidenau 140/80 T-17 Tyre K60, Heidenau K60 tyre review, morocco overland, Suzuki GS500R overlander, Tested: Heidenau K60 tyres. Bookmark the permalink.